The SR-5000 is in a class of its own. The base model includes a 1.4 megapixel CCD (1376 x 1024) capable of capturing luminance, chromaticity, and spectral data at each pixel. In spectral mode, the SR-5000/SR-5000H is capable of measuring wide dynamic ranges from an 0.5 cd/m² to an ultra-high luminance of 5,000,000 cd/m². The SR-5000H Hybrid model includes a XYZ filter for fast luminance and chromaticity measurements from 0.005 cd/m² to 40,000 cd/m². 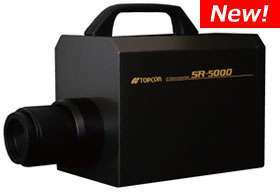 The Standard SR-5000 and the Hybrid SR-5000H can be configured with a standard or wide lens (adapter), telephoto lens, or macro lens depending on your application requirements. If you can’t find what you are looking for, contact us for info on Topcon options and accessories.